Experience the thrill of riding in the cab of an iconic Pendolino tilting train, travelling over the West Coast Main Line, the UK’s busiest. We travel on board the 1220 Virgin Trains’ London Euston to Manchester Piccadilly service running via Stoke on Trent. It’s quite amazing to see the degree of tilt from the driver’s viewpoint and how easily the class 390 takes the curves at speeds of up to 125 mph! Narration is by BBC Radio 3’s Ian Skelly. 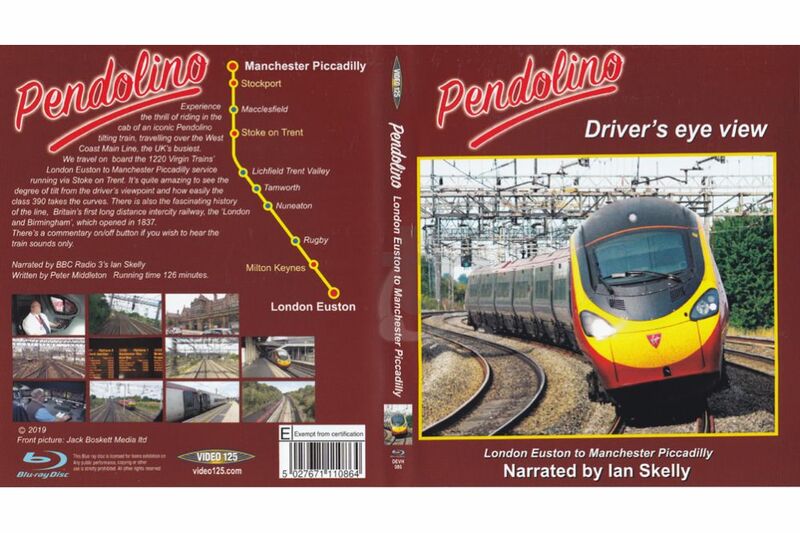 He recalls the fascinating history of the ‘London and Birmingham’, Britain’s first long distance intercity railway, engineered by Robert Stephenson and opened in sections from 1837. Our train then travels over the Trent Valley line before diverging at Colwich Junction onto the “Notty”, the North Staffordshire Railway, a company that remained independent for 75 years right up until the railway grouping.